For some reason, I thought I’d come across an Aragon puzzle quite recently, but it appears that’s unlikely as his last Listener was no. 3948 back in 2007. (He’s probably been too busy editing the Times crossword.) Here we had two classes of clue, Class I clues sharing a feature lacking in the Class II clues. 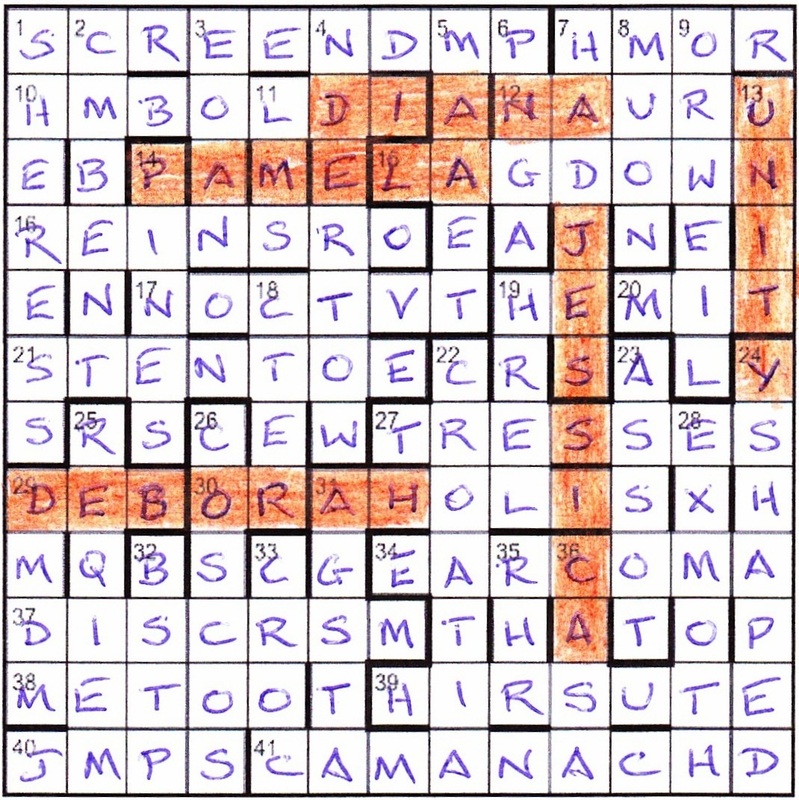 Wordplay in Class II clues led to reduced, or doubly-reduced, entries. I was lucky that I had spotted that the gird published in the newspaper had its right column missing, otherwise this may have held me up for a bit. I also noticed that, like the previous week, there were only two links between two halves of the grid. This week it was courtesy of the two-letter entries at 19 and 30ac. Despite having worked most of my life in the IT world, 1ac Display record long speech involving Nationalist politician (9, two words) eluded me (it was SCREEN DUMP). 7ac Mood the monarch exhibited in front of men (4), on the other hand, led to H[U]MO[U]R, and I was immediately minded of U and non-U, especially since this was one of the eight doubly-reduced entries. I remembered that this was the subject from Nancy Mitford, primarily because it was the subject of an EV puzzle in November last year (no. 1149, Common Usage by Raffles). Not that this was to help me a huge amount, certainly not with the endgame, of which more later. I switched to the down clues, and slotted in 2 CUMBENT, 3 EOAN, 5 MAAED and 6 PNGA. Despite now having ·C·E···MP, I still couldn't see SCREEN DUMP! The top right corner was soon completed and I found myself going clockwise around the grid again with lots of Us being dropped along the way. I liked the two females lurking in the grid: 27ac Anxieties when lacking head for taming female sharks (7) for [U]S[U]RESSES, and 1dn Spenser’s flat second soprano: cinema’s leading lady (7) for [U]SHERESS, both of which were fairly late being solved. Sneaking ahead to part of the endgame, the initial letters of the doubly-reduced entries gave me MATNJB and Sir John just needed a couple of Es to be completed. I refrained from seeing what he may have said about the Mitford family, and continued with the grid which was filled in less than two hours. The preamble now required us to “follow the thematic features of the Class I clues to read the name of an essay… and its author.” The occurrence of the letter U in the Class I clues had been obvious to me from an early stage, and the letters following them spelt out The English Aristocracy Nancy Mitford. This was the essay (in the literary magazine Encounter) where the U and non-U versions of English were discussed. I was pleased to see that I have a broad base of vocabulary, using U words like bike, false teeth and jam (not cycle, dentures and preserve) but non-U words like jack, mirror and cemetery (as opposed to knave, looking-glass and graveyard). Most rural of them all. THEIR SINS running down the central column of the grid thus needed to be replaced by I LOVE THEM, and this enabled DIANA, DEBORAH and PAMELA to appear in rows 2,3 and 8. That, however, required only 9 letters to be replaced, and we were told there were 15 altogether. Plus there were surely more sisters to be found. It was, I have to admit, only when I saw UNI·Y in the rightmost column that I saw how DGIRLS was to be replaced by THEMIT (The Mitford Girls). UNITY and JESSICA were the last sisters to be highlighted. Many thanks to Aragon for an entertaining puzzle. I just need to work out what’s meant by the title! This entry was posted on 7 August 2015 at 4:00 pm	and is filed under Solving Blogs. You can follow any responses to this entry through the RSS 2.0 feed. You can leave a response, or trackback from your own site.